Elite Riser Bed: Faster and Quieter moves Straight Up and Straight Down, 7.5" to 28"
The NEW NOA ELITE RISER BED swiftly moves from 7.5" to 28" powered by whisper quiet motors. 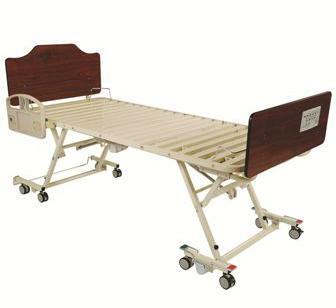 It is lighter than most high/low beds and can be easily moved at any height and in any position. The Elite Riser Bed moves quickly straight up and straight down so there is no horizontal translation, thus eliminating wall scratches or gouges. The new safety lock option on the Elite Riser bed makes it one of the safest beds on the market. The NEW Elite Riser Bed is also available with a wider sleep deck for increased comfort. bed width 35" 35" 35"
bed width, with side rails 40.0" 40.0" 40.0"
bed width, with assist bars 36.5" 36.5" 36.5"
sleep deck length 76.0" 80.0" 84.0"
overall bed length 80.5" 84.5" 88.5"
deck height range 7.5" to 28" 7.5" to 28" 7.5" to 28"